This past month I went on a little solo adventure and attended a science fiction convention. I wanted to take you with me, but I knew (and was later validated) that there would be people in costumes and displays that would have scared the hell out of you. Among other things, I did see some really great cosplayers (people dressed up in the costumes of popular comics, anime, movies/tv personalities) and most of them were characters from Doctor Who. 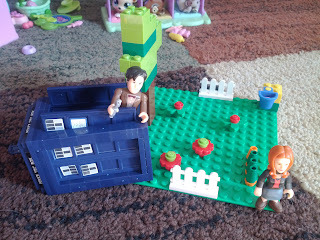 I also came across a very cool toy that I had not previously known existed: Doctor Who Lego. So I snapped it up and the next day you enthusiastically dove into it, building the Tardis, and making up adventures for the Doctor and Amy figures that came with it. You haven't seen the show since that debacle months ago when I let you watch The Eleventh Hour a little too early, and you promptly set about recreating the pivotal scene where young Amelia meets the time lord for the first time. I could hardly have been prouder. We have seen a recurrence, or maybe a cont. nuation of those troubles with school again. You have been having a really hard time with getting up for school, getting on the bus, getting dropped off. You continue to worry all day Sundays about having to go to school and once Monday rolls around the only thing on your mind is Friday night. We're going to try to make some changes, and hopefully they will help you feel better about going. Quite honestly, I have always known that you are very aware that your Mom is at home after you go to school, and its caused a lot of the concern you have. You figure if Mom gets to stay home, why shouldn't you? And I think that transfers over to when your Mom tries to put you on the bus, ir drop you off at school. We had a visit with the school principal and he agrees. So, starting now, I am staying home a little later in the mornings, and I am going to put you on the bus. I think it will be tough for a little while, but we'll get through it. So, DisneyWorld. We are starting to talk more about it now, but its funny. You have actually asked us not to talk about it, and if we throw on the DVD to look for any new info we haven't seen yet, you leave the room in a huff. You've even gone so far as to say that you don't want to go. I have it chalked up that you are worried because its so far away, and that once we actually do get close to the date, things will change. Next time I write you I will have a lot more to tell you on this subject, because we'll have already gone. Let's talk about something that you do like a lot these days: Scooby-Doo. I had introduced it to you a few years ago (again, just a little too soon) and you were not happy with it. But you caught it at a friend of yours recently and can't get enough of it. Now we record it every day, we rent the movies, and you watch them over and over. You love to try to figure out who the villain is in ones you haven't seen yet, and I can't figure out if you identify more with Velma or Daphne. I think you currently want to be both of them. Its fun because other than a few movies that we've both liked over the years, a lot of the content you've been into hasn't been my cup of tea. But I'm as big a fan of Scooby as you are. I grew up with the old cartoons, so its fun to watch with you. I'll keep feeding this particular craving for as long as I can, but I won't claim success until you want to watch Star Wars with me.